CamDVR - Your Digital Video Recorder Software. CamDVR - Use All Kind Of Video Devices. CamDVR - Use your Webcams in your Home or Office. CamDVR - Use the available Video Filters for your Application. CamDVR - Use the Motion Detector and the Scheduler. CamDVR - Always have an Overview of all running Cameras. CamPermanent - Is your personal digital security center. CamUniversal - Is the solution for all of your video demands. CamLAN - Is the solution for viewing all of your video devices. With the software products from CrazyPixels, working with your video devices is an easy task! From private use to professional video surveillance – all areas are covered. The easy-to-use products are very powerful and flexible. You can use our products to build a video surveillance system at your home or company with all available cameras. 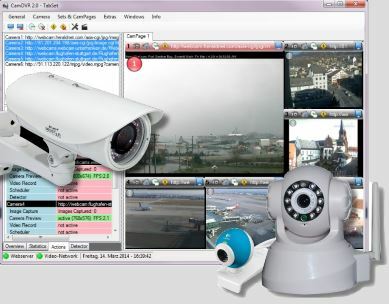 Webcams, IP-Cameras, Netcams, capture cards and more are supported. Please have a look at the free trial versions of our products! Additional you can find here some useful Freeware for your daily work! Click here to find everything about the CrazyPixels products! Click here to watch a visual comparison of the properties of our products. The CrazyPixels Newsletter informs you about new releases updates and more. Click here to watch a Live Camera in action!